Rome – The danger of an even scarier Islamic State hangs over Iraq’s future. If people “remain homeless and without jobs”, this situation “will become fertile ground for new extremism;” this is why it is even more urgent “to support the work of reconstruction”, this according to Mar Louis Raphael Sako, the primate of the Chaldean Church who is currently in Rome with other Chaldean bishops for an ad Limina Apostolorum visit with the pope in the Vatican. “Some Christians have been able to return to their homes because the Church has helped in the process of repairing houses and restarting activities,” the prelate told AsiaNews. “However, as crucial as this task is, it belongs to the government. And many Muslims “have not benefited”. On 31 January 2013 the then archbishop of Kirkuk, Mgr Sako was elected new Chaldean patriarch, succeeding Emmanuel Delly III who had resigned because of age. Born on 4 July 1948 in Zakho, northern Iraq, Mar Sako was ordained priest on 1 June 1974. As prelate, then as a primate of the Iraqi Church, he has repeatedly denounced the exodus of Christians from the country and made several appeals to the central government and local authorities to guarantee Christians a peaceful future in their land of origin. In the past five years, the patriarch has had to face several challenges. “I have always lived with problems, challenges. First came the Islamic State, then the flight of our people, and next the need to help and support them with housing, food, medicine, schools. The greatest satisfaction from being elected Chaldean patriarch “is the faith of our people”, who are not afraid to “give up everything for Christ”, who, faced the violence and madness of jihadism, “lost everything so as not to lose their faith “. This, he notes, is a source of “enormous richness and joy”. However, there is also “deep sadness” for the exodus of a substantial part of the community. Out of about one and a half million people who lived in Iraq in 2003 at the time of the American invasion, only half a million is left. “It is hard to look at the huge pains these people have gone through, going abroad without knowing if they’ll be welcomed, suffering from every day’s reality as well as homesickness”. Fortunately, the meeting on Monday with Pope Francis, which lasted more than an hour and a half, is a source of renewed enthusiasm and strength to pursue the mission. 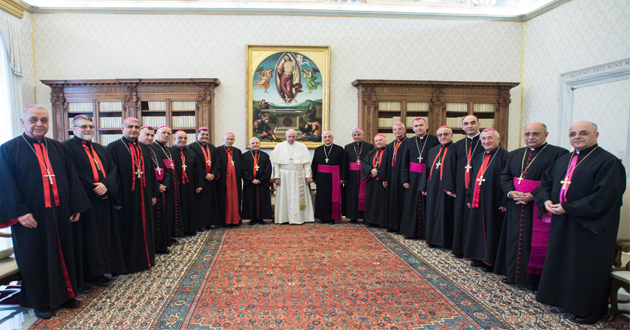 Accompanied by Chaldean bishops, Mar Sako stressed three essential points for the future of the Church in Iraq: the challenges and sufferings of Christians require particular attention from the Holy See, the need to renew the liturgy by adapting it to the current mindset and culture because it must help people to pray and live everyday life, and the controversy over Jerusalem and the importance the holy city has for Christians, Jews and Muslims. Lastly, the Chaldean patriarch urges the people of Iraq as a whole to take “a step forward” towards peace, reconciliation and reconstruction.